Veh. search leads to the arrest of Daniel Hernandez for possession of a gun and possession of narcotics. DATE/TIME: January 14, 2019/ 1251 A.M.
On Monday, January 14, 2019, Deputy Gile from the Central Station conducted a vehicle check in the area of Vista Grande Way and Grand Terrace Road in the City of Grand Terrace. When Deputy Gile contacted the driver, Daniel Hernandez and a female passenger, he observed an open bottle of alcohol and detained both subjects. 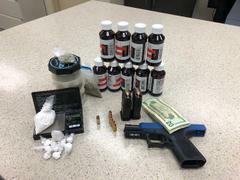 A search of the vehicle was conducted and a backpack containing a loaded 9mm pistol, 50 grams of cocaine, psilocybin mushrooms, marijuana and prescription cough syrup (Promethazine with codeine) was located. Daniel Hernandez was arrested and transported to Central Detention Center where he was booked for sales and transportation of narcotics and possession of a gun.